Joe Chirichella of Midland Park, NJ joined Dougie’s Team to represent the Flutie Foundation at the 123rd Boston Marathon on April 15, 2019. Joe was selected out of 200 applicants because of his passion for running and fundraising through his vast network of family, friends and co-workers. Joe was inspired by his close friends who are caring for a love one with autism. His personal experience of watching them struggle to find and afford appropriate care inspired him to set out with a goal of raising $100,000 for the Flutie Foundation and the families we support! Once selected to join Dougie’s Team in the Fall of 2018, Joe immediately kick off his fundraising campaign and he has not slowed down since! To date, Joe has raised over $39,000 already making him the top Dougie’s Team fundraiser ever for a single athletic event! He continues to receive amazing support from his colleagues at Becton Dickinson which has a strong culture of philanthropy thanks to their generous charitable matching gift program. Joe has also garnered the support of several restaurants in his hometown. On January 6th, Joe hosted a fundraiser at Blue Moon Restaurant in Wyckoff, NJ, which raised $1,310 dollars in single day. Blue Moon generously donated a portion of the days sales and held an on-site raffle. 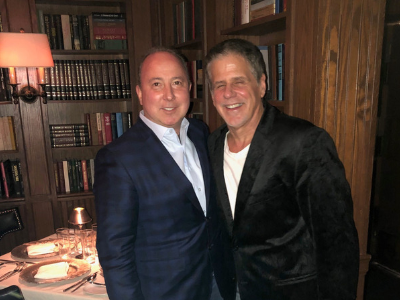 On January 14th, Joe then hosted an event at Esty Street, a swank private supper club in Park Ridge, New Jersey offering it’s guests an eclectic American menu with international flair. Owner Kim Costagliola donated 100% of his profits that evening which rasied $3,450 for Joe and the Flutie Foundation!